We are a small hobby farm located on the beautiful Olympic Peninsula in Sequim, Washington. 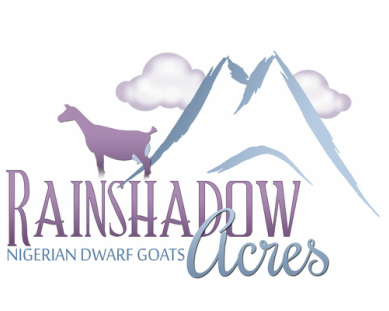 We raise ADGA registered Nigerian Dwarf goats. We chose Nigerian Dwarves because their small size makes them easy to keep on our little bit of acreage. They produce sweet milk with a high butterfat content, which makes it perfect for making all kinds of goodies including cheese, ice cream, and even goat milk soap. We think these goats are the most wonderful little animals. They have sweet dispositions, love attention, and their antics provide us with constant entertainment. Our goal is to produce healthy and friendly animals with excellent milk production and show quality conformation. We participate in DHIA milk testing and ADGA's linear appraisal program.